Kenwood were called to an amazing Grade I listed property in Tunbridge Wells. 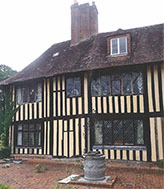 The main building was constructed in the 1400’s and was a medieval war house. Treatment was required to a section between the bedroom and study areas. 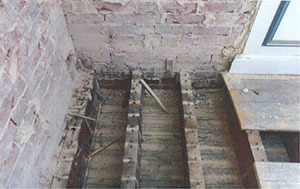 Dry rot can be aggressive and is best treated as soon as possible to prevent it spreading to other areas. In order to treat the dry rot we have cut back the decayed timber ends and inserted new support, whilst retaining as much of the existing timber as possible. The timbers are now isolated from the brickwork to prevent a future problem along with a preservative treatment to the adjacent area. With repairs to the rainwater goods and this treatment now complete we hope the property can continue to provide a home for families for future centuries.